Early in 2009, after the whirlwind of the attack, buying my first home, working on New Year’s, and Cabbiegate, I attempted to organize my documents for Italy. One contained receipts of everything (expenses to change flight home, extra meals I paid for due to my extended stay in Italy, receipts for mailing documents to my attorney), one had my police report and other formal documents (so I could pdf them as soon as possible) and one was created with the intent to be a file of all information I’d come across on being a sexual assault victim. This folder had one document in it at the start of 2009, and it had been given to me by the US Embassy in Rome. Each state in our glorious Union has a crime victims compensation fund. The terms of what is deemed eligible for compensation varies. 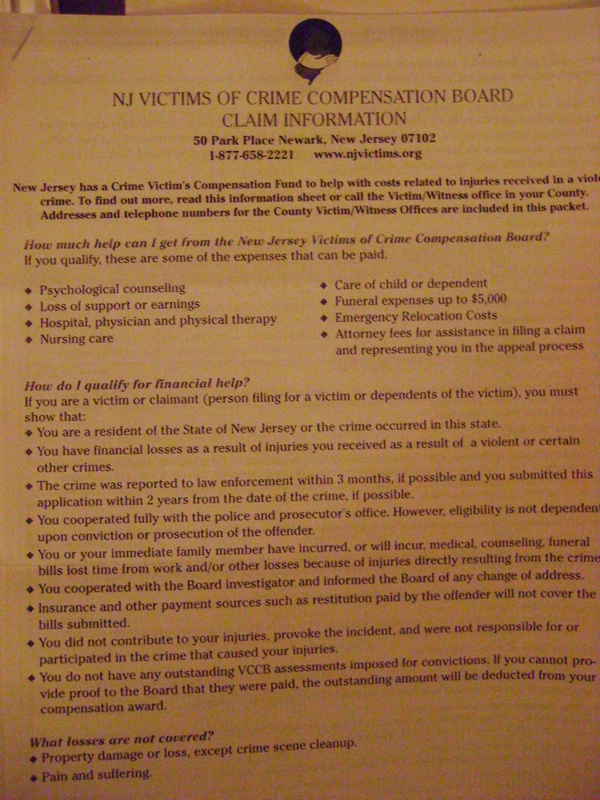 On first read of the document, it was unclear to me that I, as a victim of a crime overseas and not in New Jersey or the U.S., was even eligible for compensation. But that did not stop me from calling the number on the page. I called and spoke with a rep who told me that she’d mail me the complete application and to just write in that the crime had happened to me in Rome, Italy. The form itself does not have an option for overseas crime victims. I received the forms in a week or so and looked through them. First you should know that there is a time limit on when you can file. For NJ, you can file up to but not beyond two years after the date of the crime (and you had to have reported the crime within 90 days of it happening). 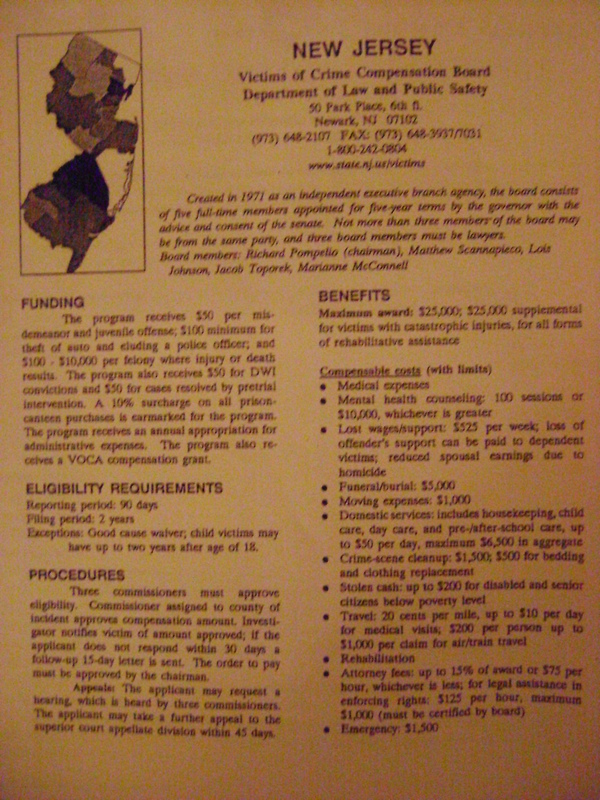 Second, the NJ program is geared toward people who have suffered documentable injuries that prevent them from working/earning wages and result in other quality of life losses. There is some assistance with attorney costs, crime scene cleanup, emergency costs, etc. For me, the part that was relevant was costs of travel to and from court hearings; if I had to go back to Rome, I could possibly qualify (turns out, I didn’t), so I would check back in with the form every few weeks as my case progressed (and my costs increased). Being that I was not certain what Marco’s ties were to organized crime, it wasn’t entirely clear yet what I qualified for. But I had nothing to file at the time. If you are a victim of crime stateside or overseas, contact your state to see what you might be eligible for. And know that your circumstances immediately after the crime might differ from a year or two years after, so don’t dismiss your state’s program right away if on first glance it does not seem to suit you. Next SELF DEFENSE – Part 2..Hallelujah!